This will be my last post about quiet books for a while! Thanks for your patience, friends. I know you’re not all rearing little ones, but… yanno… it was a big project for me so I’m still excited about it :D. But really. Last one. For a long time. So I made 16 sets of this page. They are felt chain links that can be snapped together to form a rainbow chain. 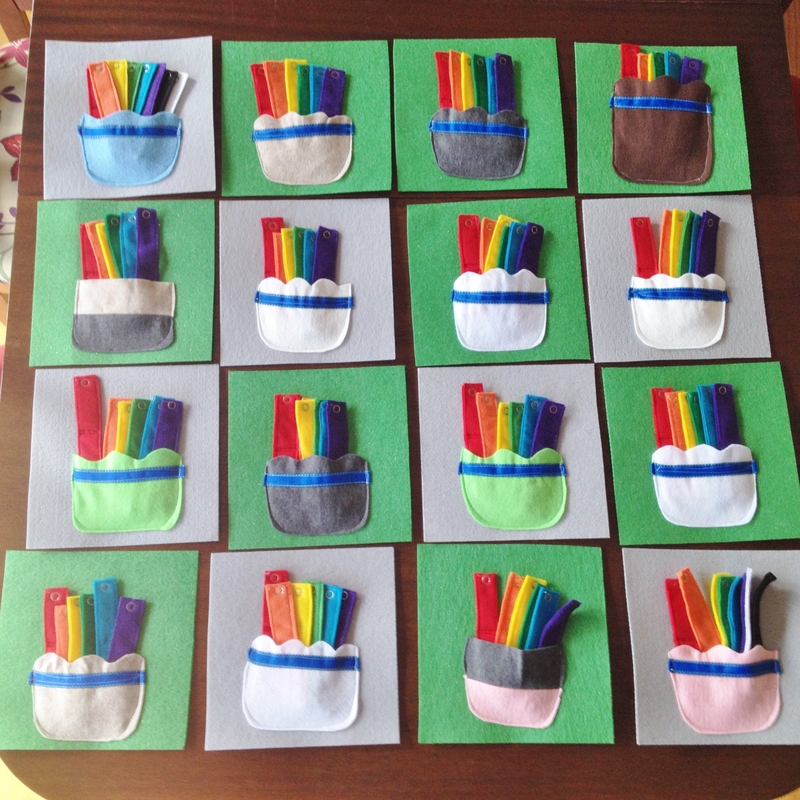 Kids can (quietly) practice their rainbow colors while getting some fine-motor skill practice in! Nice, right? The most annoying part was learning how to apply the snaps. It wasn’t hard to do, but I had to do some research to figure out the easiest and least expensive way to apply the button snaps, since I had (16 x 8 x 2) = 256 of them to do!! Although it took a lot of time, I had fun making these pages! 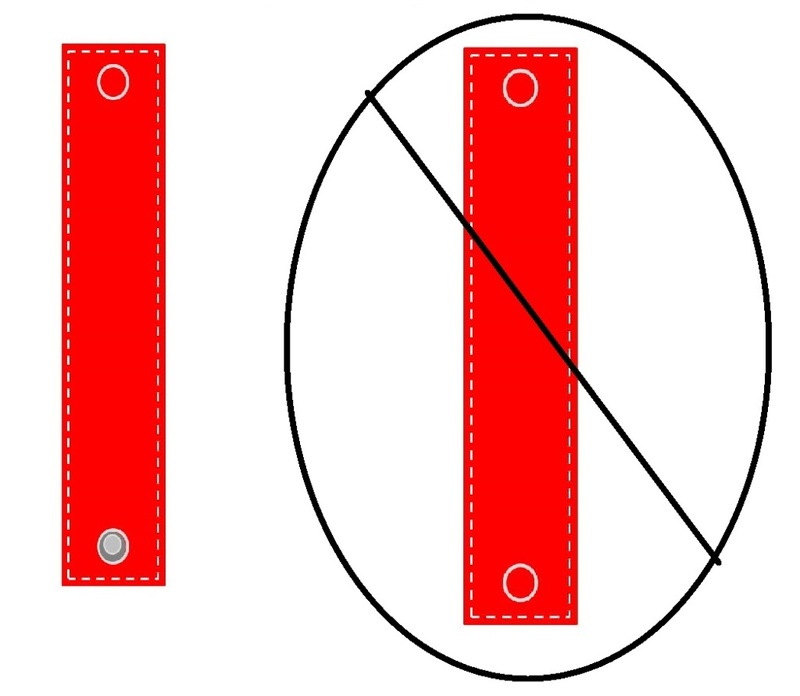 Optional: decorative ribbon for pocket. Sew on a pocket. My pockets were roughly 6″ x 3″. After cutting out the pockets, I sewed on a decorative ribbon for a little pizzazz– totally optional. I centered and sewed down the pockets along the bottom of the page. 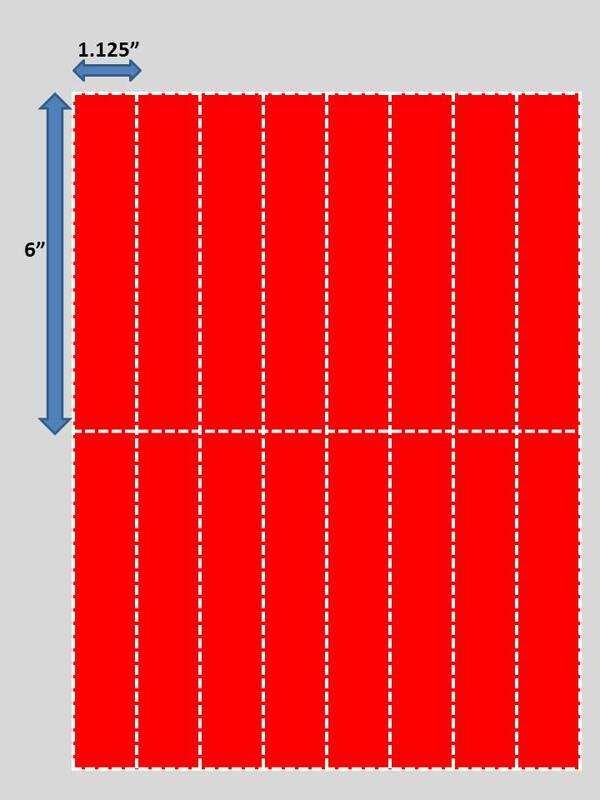 Remember to leave a 1″ border along each side if you’re doing this for a group project. 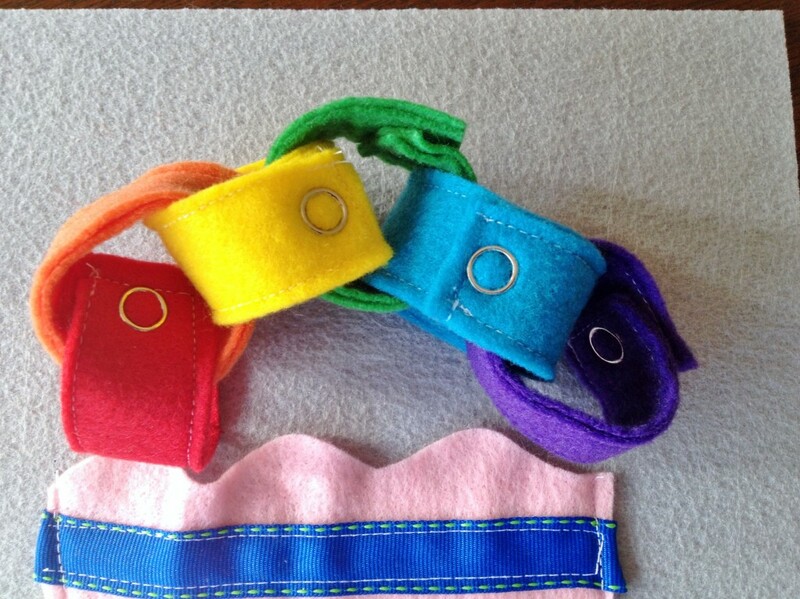 Pair up each strip with another, then sew them together leaving 1/4″ around the edges to make 8 nice, sturdy links! Repeat for all other colors. Apply the button snaps onto the links. There are four pieces of hardware per link. The circular rings with sharp teeth hold each of the button halves in place. 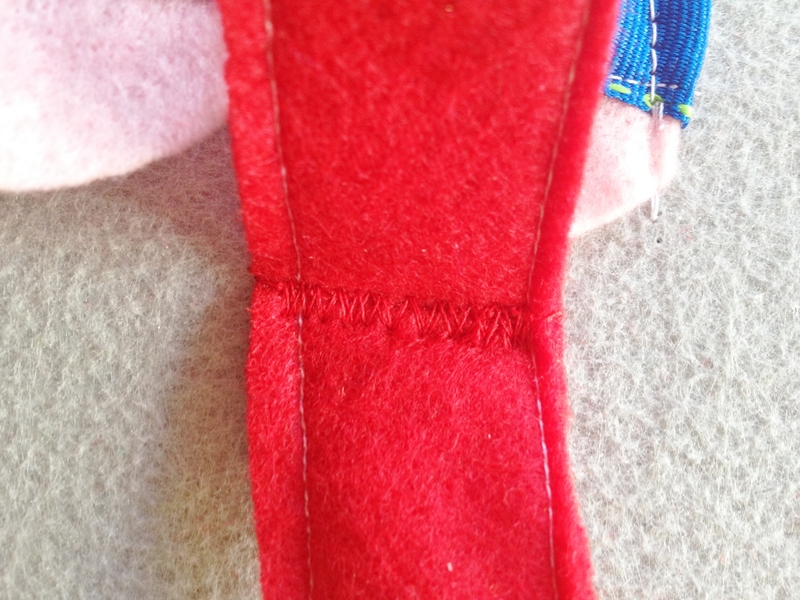 To begin, push one of the circles with “teeth” through the two layers of felt. 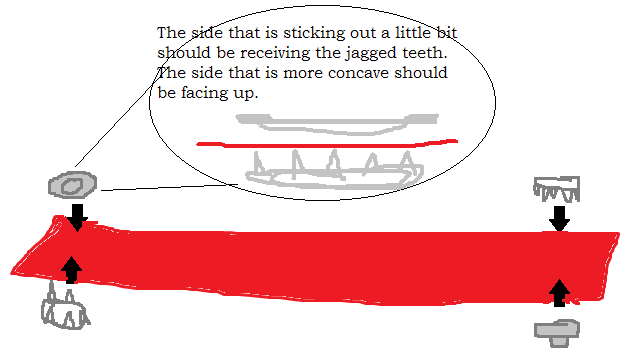 (I used one of the flat snap pieces to push around the felt until the teeth showed through. It can hurt if you use your fingers repeatedly…). Center one button end on top (see diagram below). 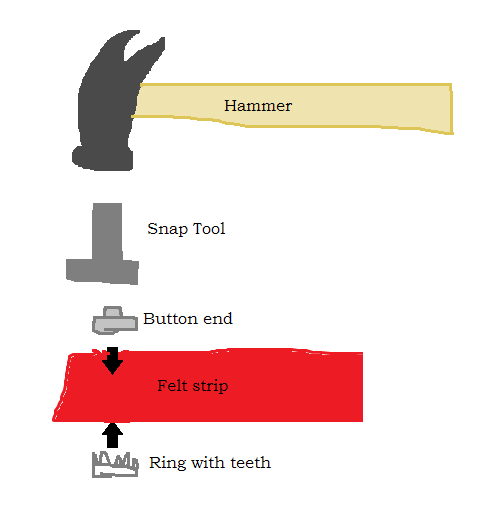 Place your snap tool on top, then hammer down with 4-5 taps until you feel it squeeze into place. Repeat with the other half of the snap. If you did it all wrong, don’t worry too much– felt is very forgiving. Just make sure you order a few extra snaps for mistakes here and there. Repeat for all links. Note: If you get confused about which part of the snap should be on which side, just remember that there should never be two hollow circles on the same side of the link. Stitch down one link as an anchor. Ta da! All done! Put your completed strips into the pocket and it’s ready to go. Didya notice that I snuck in black and white along with the traditional ROYGBV? It’s because I also decided to make a Gospel Expansion Pack (double meaning? I think so!) 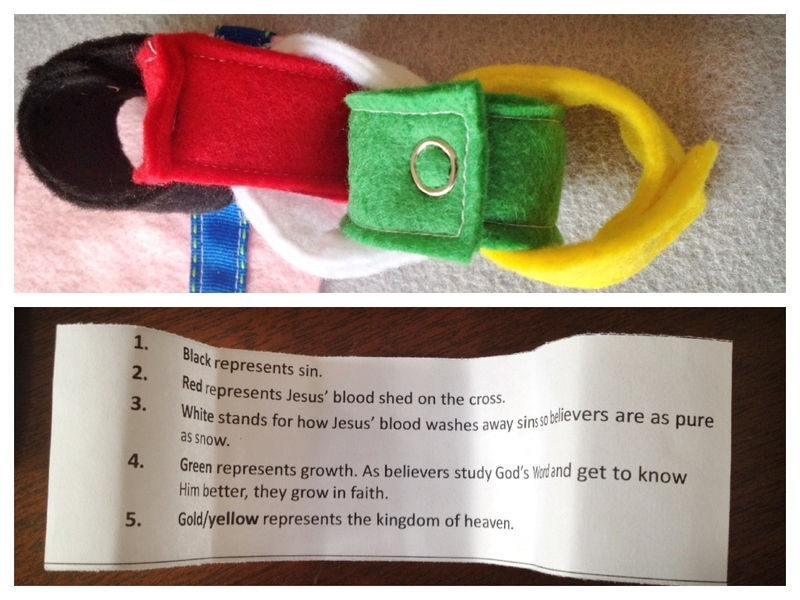 so we could use colors to teach our children the Gospel. I was giddy with excitement when I came up with the idea, and took a little longer than necessary formatting the papers to print out just right. It was totally worth it. :] May it help our little ones internalize the Good News and help them share it with others! So there it is. The craftiest I’ve gotten in a really, really long time. Haven’t touched my sewing machine since quiet book making, but I’m already starting to think of ideas for the next group project 🙂. 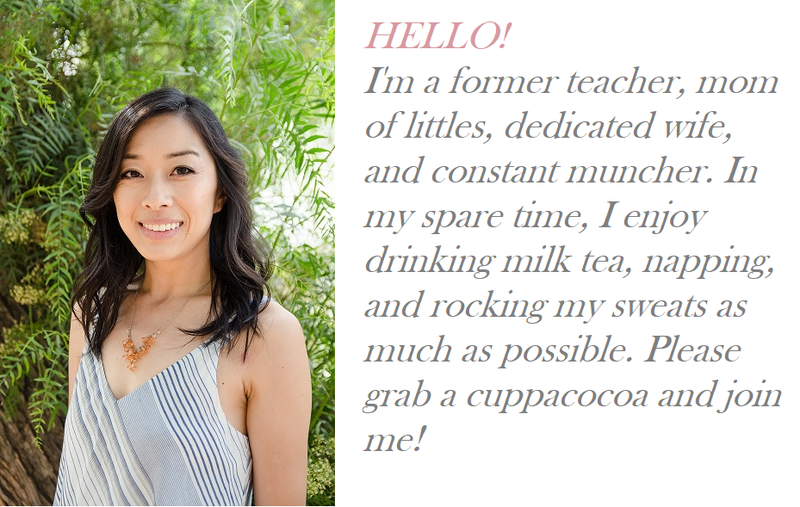 Hi, Thanks so much for the tutorial and the Amazon links! I am making a page like this for my quiet book group. I’ve got my floppy felt and I bought some plastic snaps. I tried the snaps and they barely went through the fabric and didn’t stick together. The back just came right off the front snappy part. So I think I want to try these metal snaps that you used but I wanted to ask first if you had trouble with the snaps not staying together? My snaps definitely stay together. They’re a little tricky to get on, but once you get the hang of it it’s not bad. Good luck! I love this idea, I am going to do it for my own book group project! How long would you say it too you per page? Also, do you think it would be possible to use just one piece of stiff felt instead of sewing two together for each link? It would save time, but would it be too flimsy? Hooray! You are doing a group book project! =) I’m not sure how long it took me per page. I sewed down all the pockets one afternoon… cut/sewed the links over a few nap times… and hammered in the snaps over two Saturdays when my husband watched the baby so I could work on it. I didn’t used stiffened felt for the links– I used regular/floppy felt. It would definitely save time to do just one piece, though. 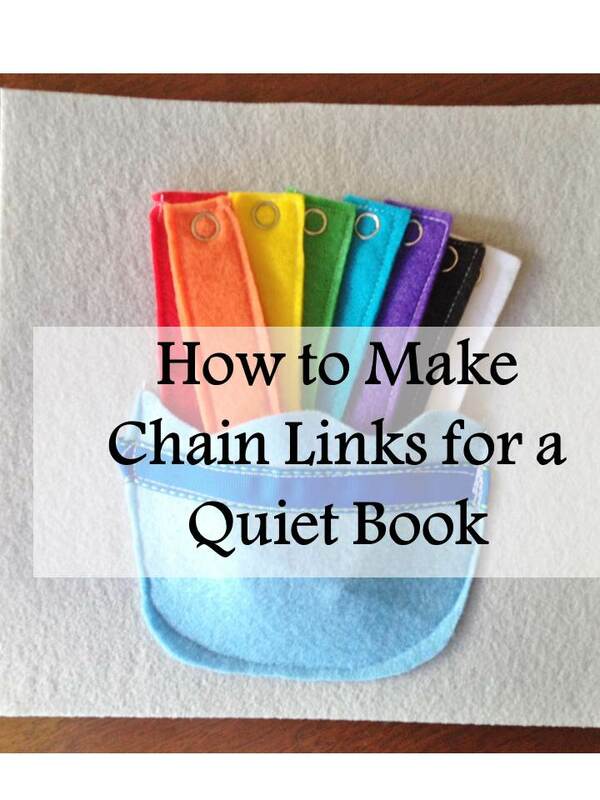 I have seen some links that use velcro and one piece of felt– just search “Velcro chain links quiet book” on Google. That would probably cut your work in half, at least, because you won’t have to sew the rectangular strips back to back, and you won’t have to put in the snaps, using just velcro instead. I think one piece of felt with snaps would be too flimsy, so I’d either go with the double-sided felt + snaps OR single-sided felt + velcro. Good luck! One more question! Did you use the same brand snaps you linked on Amazon? I ordered a sample from an Etsy shop and I’m worried the prongs won’t be long enough to hold through two layers of felt. I don’t have the tool yet, so maybe that will make a difference! Yes, I used the same ones I linked on Amazon. They were a little hard to push through at first, but you get the hang of it after a few tries (and a couple mess ups haha). 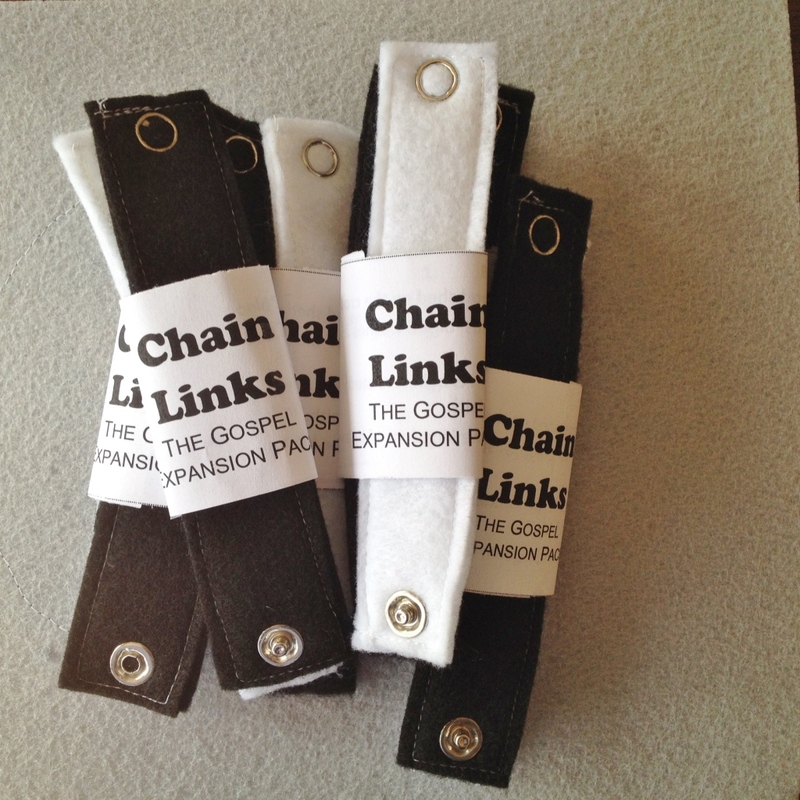 I LOVE the idea for gospel chain links, with colors representing the gospel message!!! Thank you for sharing!! Thanks, Mom :). I thought you would. I think I get part of my passion for evangelism from you!